Through the Mardi Gras Recycling Initiative, YLC Recycles and Arc of Greater New Orleans work together to make Mardi Gras season greener and more environmentally sustainable for future generations. Learn more about how you can support this historic new endeavor, below! The Mardi Gras Recycling Initiative Returns in 2019! Coming off a successful pilot program for the 2018 Carnival season, Young Leadership Council (YLC), through its YLC Recycles project, and Arc of Greater New Orleans (ArcGNO), are bringing back the Mardi Gras Recycling Initiative, February 23 and March 2. We are incredibly excited to build upon last year’s successful pilot of the initiative, which kept 2,500 lbs of beads, 10,000 cans, and 2,000 plastic bottles out of Louisiana landfills from just one day of parades! Learn more about this partnership between YLC and ArcGNO via the press release below. 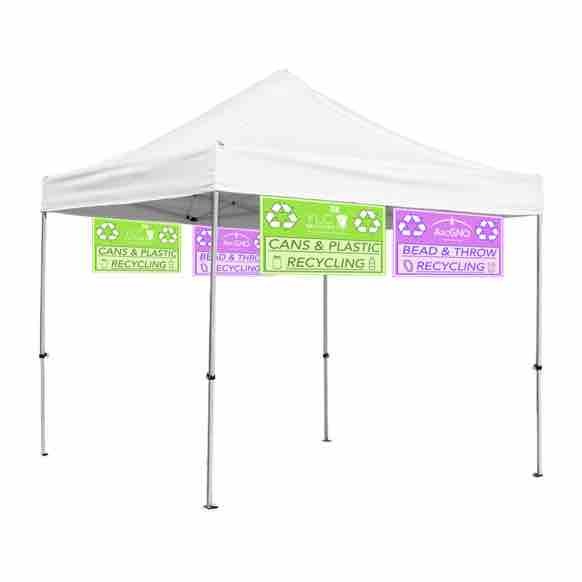 Through the Mardi Gras Recycling Initiative, YLC Recycles and Arc of Greater New Orleans are working together to make Mardi Gras season greener and more environmentally sustainable for future generations of New Orleanians. In 2016 alone, 940 tons of waste was collected off the streets during the carnival season. A significant amount of this material is discarded or neglected single use items that could easily be recycled or reused. The waste poses many environmental hazards and is costly to clean up. 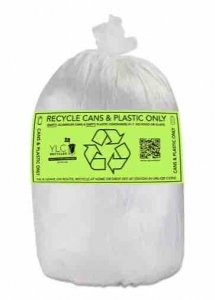 Recycling bags will be distributed by uniformed YLC & Arc volunteers before, during, and after parades to Krewes and members of the public along the parade route. 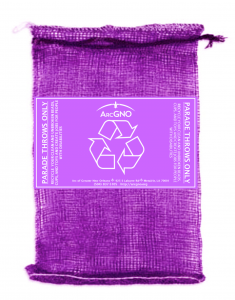 Two types of bags will be distributed: purple mesh bags for recycling beads and transparent bags for plastic, aluminum, and paper recyclables (see images below). Six designated collection stations will be set up along the Uptown parade routes to accept recycled waste, with detailed instructions indicated on each bag. See our map with official collection point locations, below. The public is asked to drop off bags at designated recycling stations on the route, or along the curb, which will then be collected by volunteers following the Krewe of Freret parade on February 23 and the Krewe of Tucks parade on March 2. Collected beads will be brought to ArcGNO’s Recycle Center, where they will be sorted, re-packaged, and resold, providing jobs for those with intellectual disabilities. Collected plastic, aluminum, and paper recyclables will be brought to a local recycling center for sorting and processing. disposable waste. Find the location most convenient for you, below! Station 4: St. Charles & First St.
Initiative volunteers will be wearing lime green vests and will be passing out recycling bags along the Uptown route (between the recycling stations shown on the map, above). 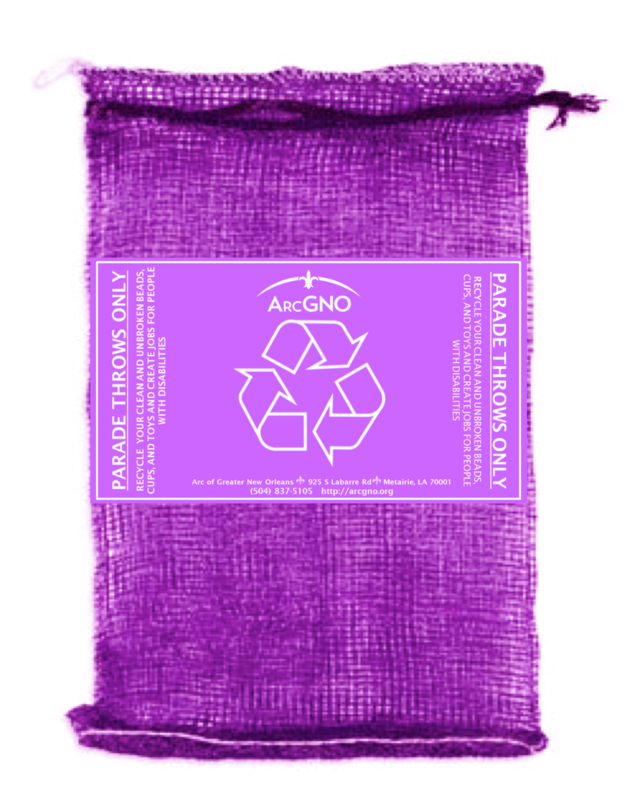 Recycling bags, whether they are green or purple, come in two types: aluminum/plastic waste and parade throws. Scan the QR code on the bag for a list of recycling locations! Drop off your full recycling bags to one of these six stations located along the parade route. A full map of the locations can be found on this page. 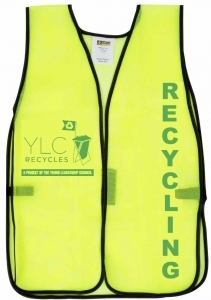 Contact the YLC Recycles team at recycles@ylcnola.org. More than 200 volunteers are needed to make this historic initiative a success! Choose a volunteer shift and sign up today. YLC and ArcGNO are committed to supporting a greener and more sustainable New Orleans for future generations to enjoy. Whether it’s through YLC’s projects that provide recycling services and install bike-racks across the city, or ArcGNO’s year-round efforts to recycle Mardi Gras beads and employ those with intellectual disabilities, both organizations depend upon your support to continue our work. Please consider making a tax-deductible donation to YLC and ArcGNO, below.